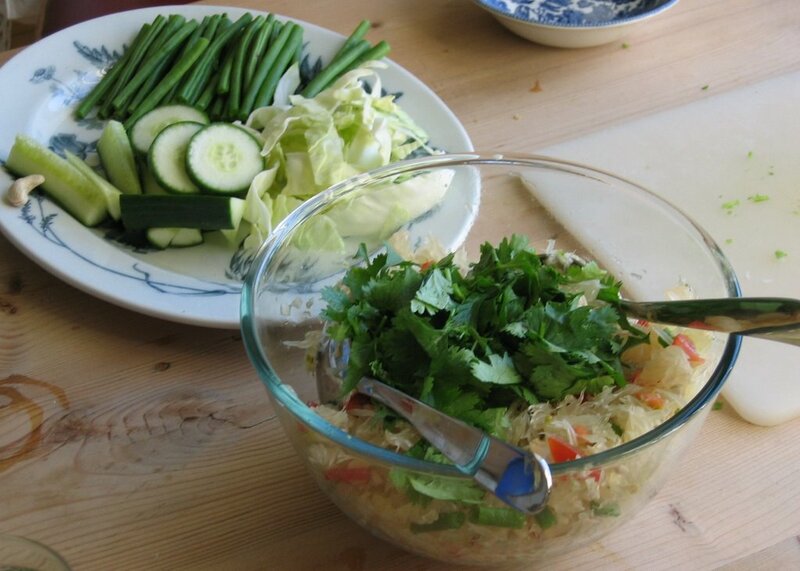 Posted by cath in general info, Info and Cooks Notes, ingredients, shopping notes, Thai food. 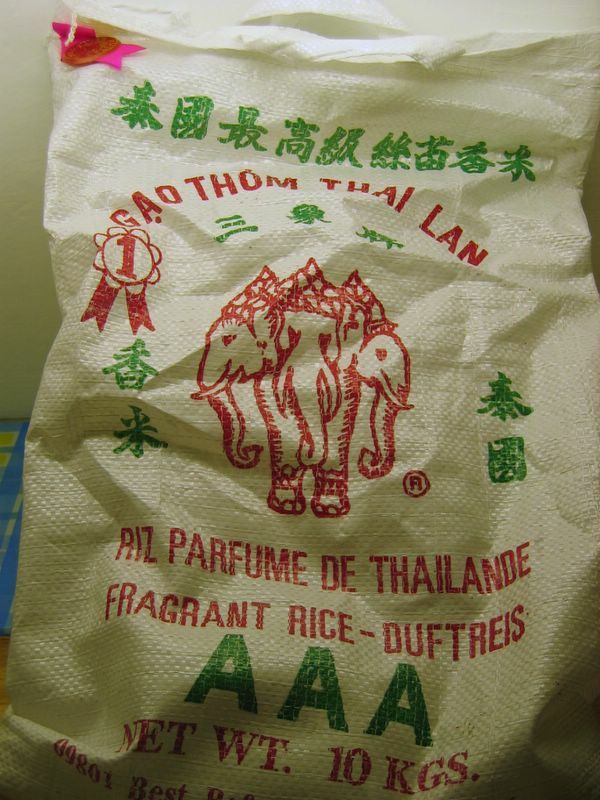 Buying large bags of rice from the Thai or Chinese Supermarket is great value, here is my favourite brand, but others are also good. Look out for AAA quality and the words “New Crop”. Also it is worth double checking that you are not buying “broken rice” which although cheaper is long grains that have been broken or crushed, so it won’t make the best fluffy steamed rice. I actually prefer Thai rice to Basmati (although many people still consider this to be the finest rice you can buy), by all means use Basmati if you prefer it, but think about trying Thai Fragrant Rice with your Thai food. I am lucky enough to have a fantastic National (aka Panasonic) Rice Cooker (5-portion) from Thailand which I have been using for years to cook ‘easy and right every time’ steamed rice. If you have the space, and cook a lot of rice, then investing in one of these is really worthwhile. You simply measure the rice in the provided cup, give it a little rinse, then add cold water up to the appropriate mark in the pan and switch on. 10 to 20 minutes later (depending on the amount of rice being cooked) your rice is perfectly cooked – magic! Microwave steamed rice. Using a very large glass bowl or dish, with a lid, place 1 small (i.e. coffee) cup of rice per person in the base and fill up with twice as much water (or make sure there is a bout 2cm of water covering the surface of the rice). Steam in the microwave on high for 12 minutes with the lid on. Then check the rice to see if it’s cooked. It should be soft with a small bite to it, not chalky. Put back for a few minutes if it needs more cooking. You can also buy special rice cookers for the microwave which include measures similar to a stand-alone rice cooker – look out for these, they are really good and especially good for doing 1 or 2 portions quickly. The one I have is Japanese, so I can’t tell you where to find them, but I have seen microwave steamers in the UK, so have a look in your local cook shop. You can cook rice on the stove top – again using the reduction method, i.e. measureing the amount of water added carefully (1 part rice to 2 parts water) and letting the rice absorb the water with the lid on – don’t lift the lid early as the steam will escape and your rice will not cook as well. It should take around 10-15 minutes again, depending on the amount of rice. The benefit of the absorption method is that there is no draining and your rice will be fluffy rather than soggy. A thin, brown, salty liquid used instead of salt, similarly to soy sauce in Thai recipes. Darker sauces are higher in quality and have a strong fishy taste rather than being just salty. 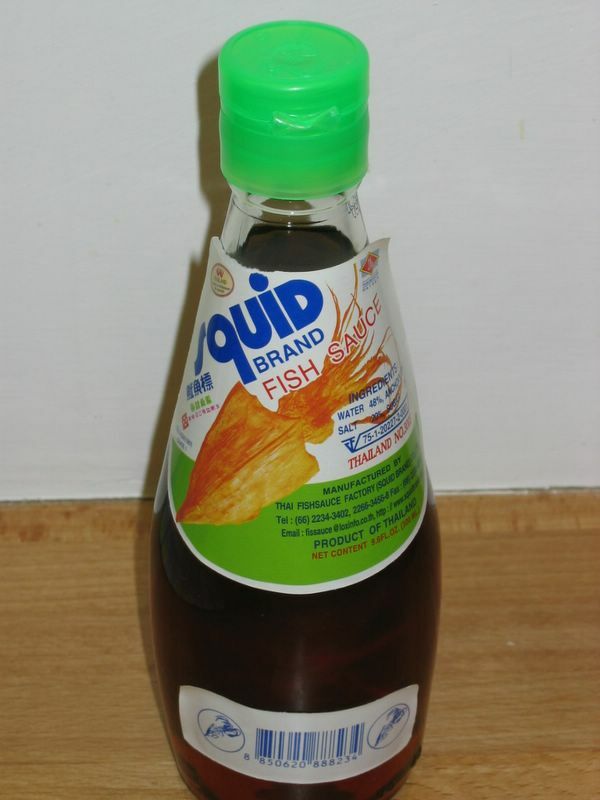 Seriously though, soy sauce can be used as a substitute, especially for vegetarians, but nothing compares to the classic taste of fish sauce in your Thai dishes, try it! Although fresh coconut is far superior, it is not something that is easy to get hold of here in the UK. If you fancy making it yourself I’ll post a recipe for that in the future. For now, to get started, tins of coconut milk make an excellent substitute. Here are my two favourite brands. Aroy-D (‘Aroy dee’ meaning yummy in Thai) and Chao Koh. 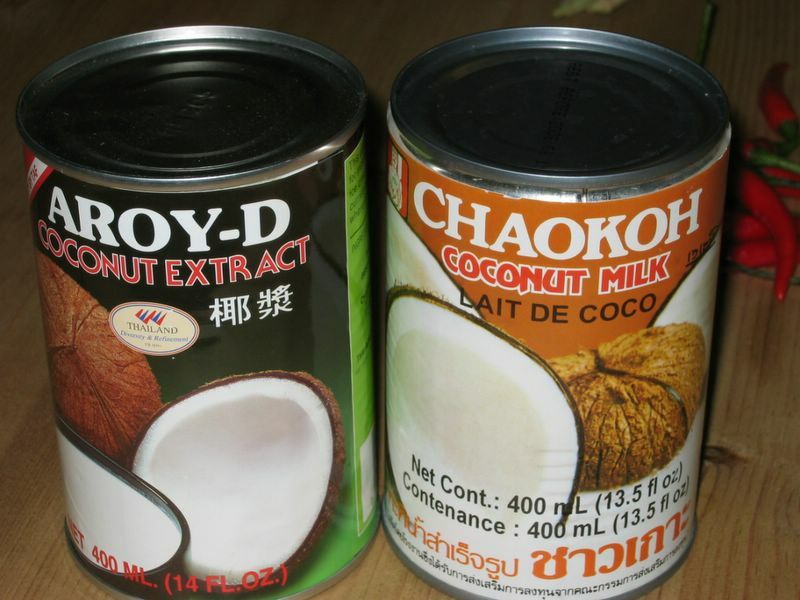 Be careful of buying cheap brands as they have too much liquid and not enough coconut in the can. Also watch out for sweetened versions of tinned coconut milk – make sure you are buying unsweetened milk for your curries, even desserts as you can add your own sweeteners (i.e. palm sugar) and have more control of the final flavour. A strong smelling paste made from dried shrimps (so I’m told! ), dark in colour and is used sparingly in soups, pastes and dips. These pots of paste last well in the fridge or larder. 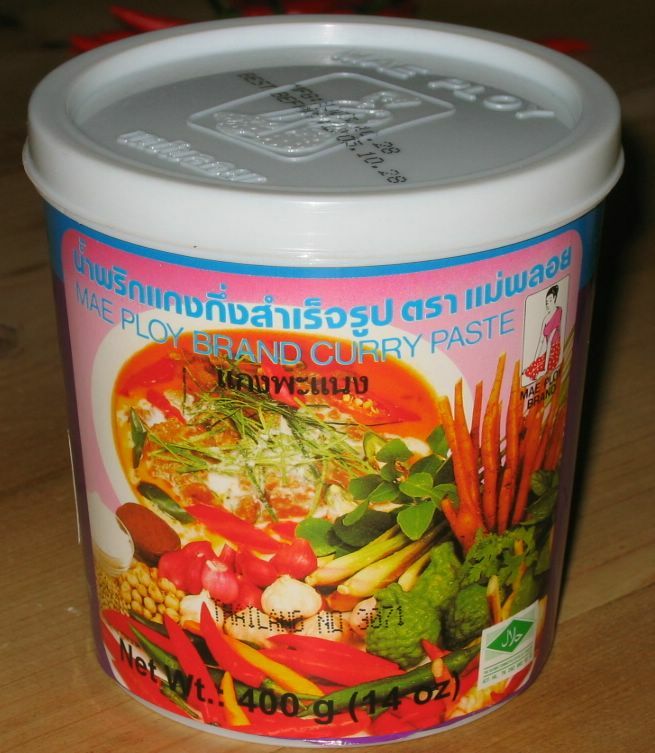 Anchovy paste can be used as a substitute, or anchovies and water blended is another option. 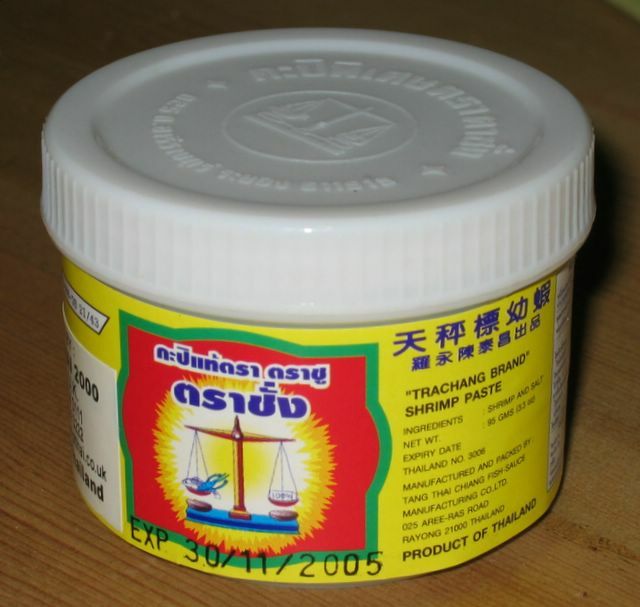 Shrimp paste adds an intense fishy and salty flavour to dishes. Pea Aubergines are small, fairly bitter versions of an aubergine. They have a fairly tough skin, and burst satisfyingly in the mouth. 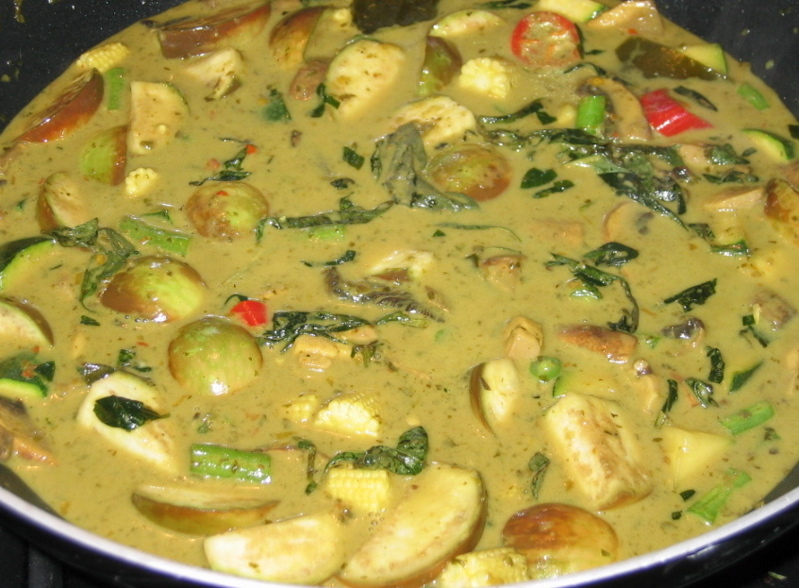 They are are usually added to curries, especially Thai Green Curry (Gaeng Kiaw Wan). 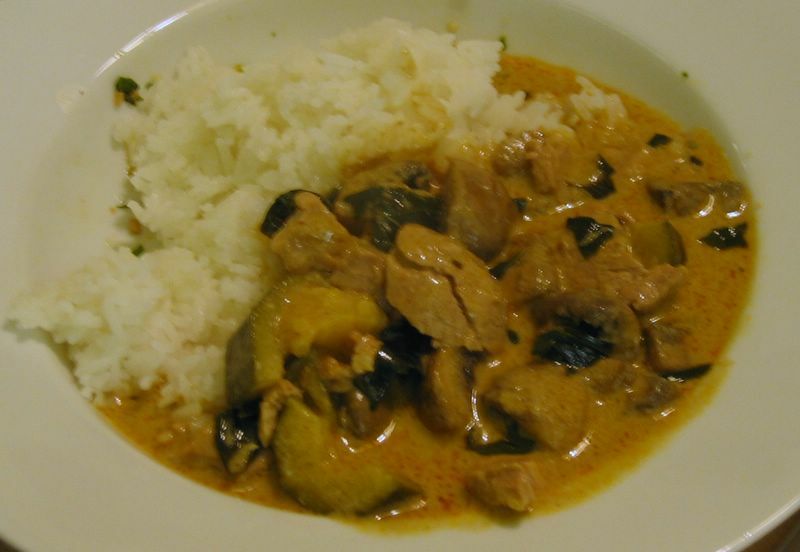 They cook quickly, and are usually added to curry for about 5 minutes to soften slightly. 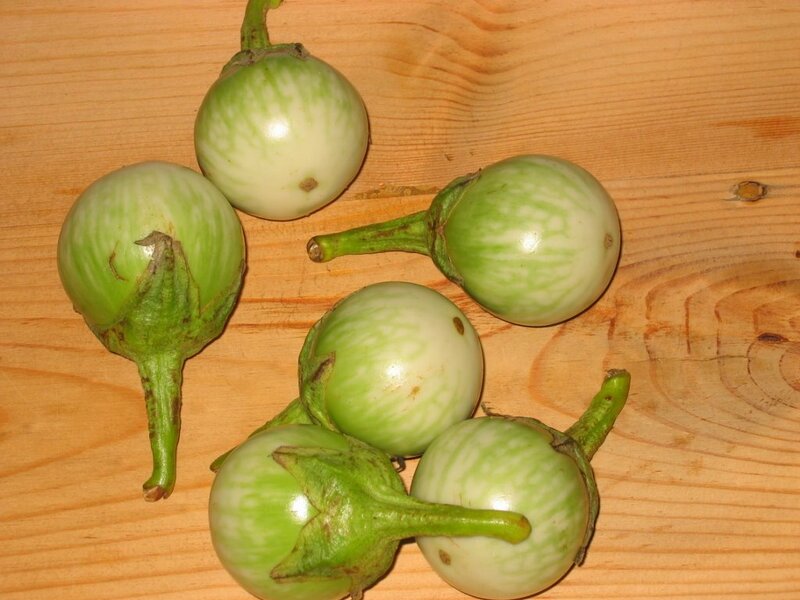 Green or Apple Aubergines are larger, round varieties of aubergine, about the size of a plum. 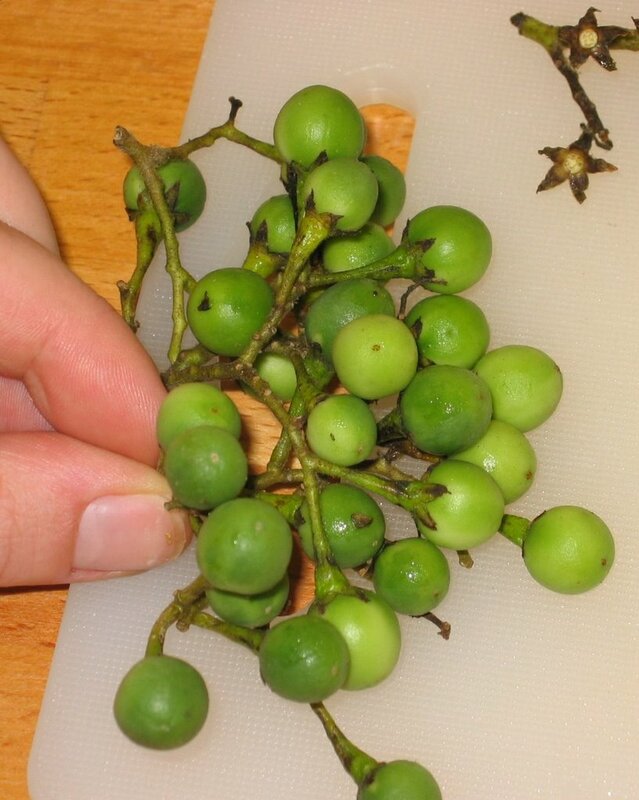 They are green and white, and are usually quartered and added to curries, especially Thai Green Curry (Gaeng Kiaw Wan). They discolour quickly, so are chopped and added immediately to the curry, and cook in 5-10 minutes when they have softened slightly. Posted by cath in general info, Info and Cooks Notes, ingredients, Thai food. A pomelo is a member of the citrus family – it is much larger than a grapefruit, the Thai variety is usually green, like limes. 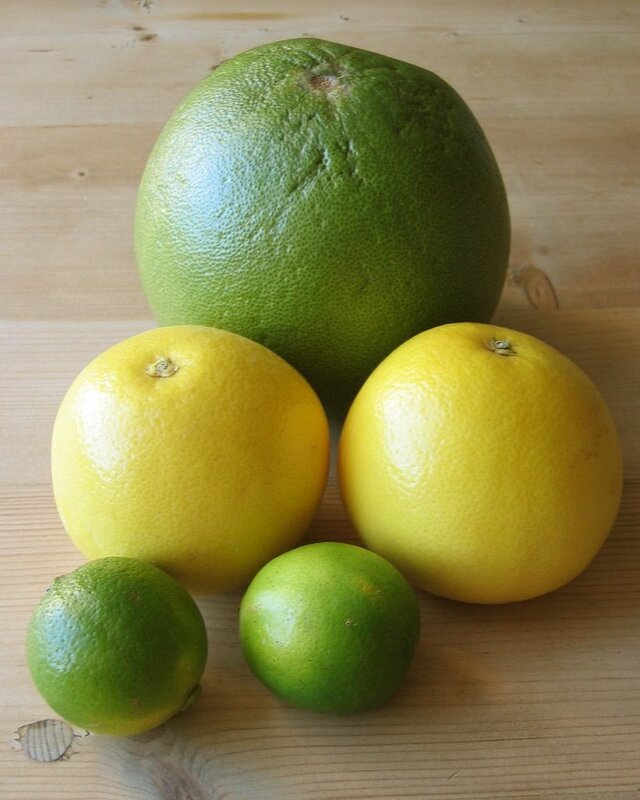 To get a sense of scale, here is a pomelo with 2 white grapefruits and 2 limes. Ready to make pomelo salad? 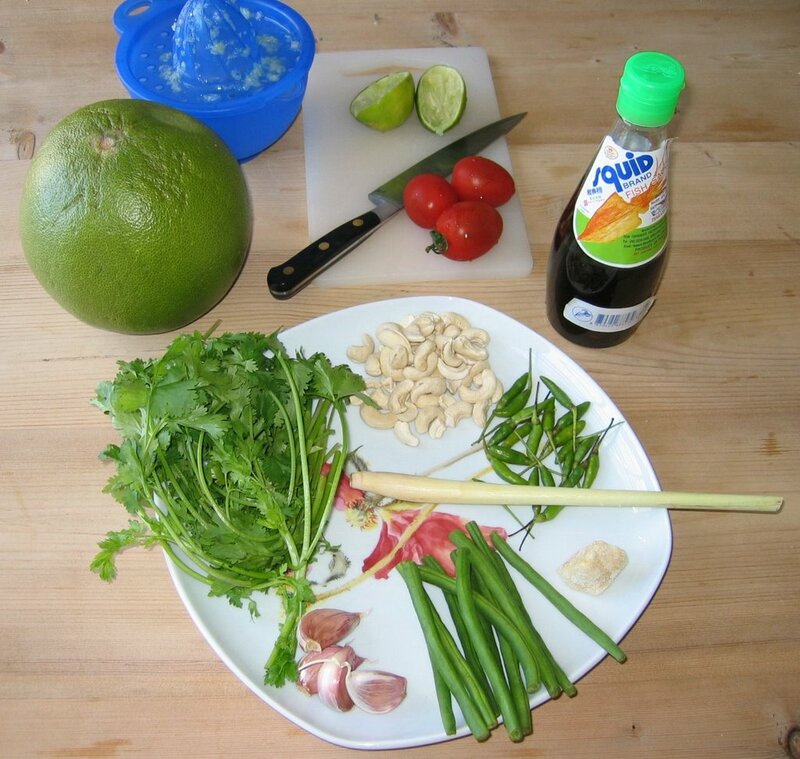 On the table (from top-left): Pomelo, lime juice, limes, tomatoes, fish sauce. On the plate (clockwise from top): cashew nuts, bird’s eye chillies, lemongrass, beans, garlic, corriander.